One last Halloween post (sorry!). 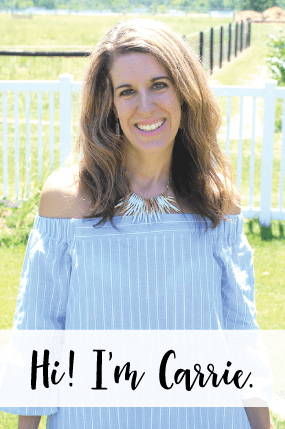 Classmates gifts and a game. So, I was pretty late at getting the classmates gifts and game done in order to post about them before Halloween. I actually ran so far behind, that I was working on their favors and the game the day OF their parties. Oops. 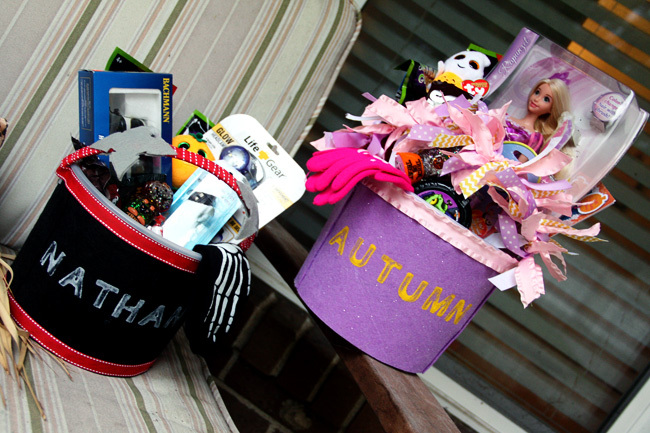 I am sure everyone is tired of the Halloween photo overload in blogland, but I really wanted to share photos. Sooo, here ya go. For Nathan’s class, I was in charge of bringing a game. I decided I wanted to stray from the traditional Halloween games yet wanted to do something pretty simple. 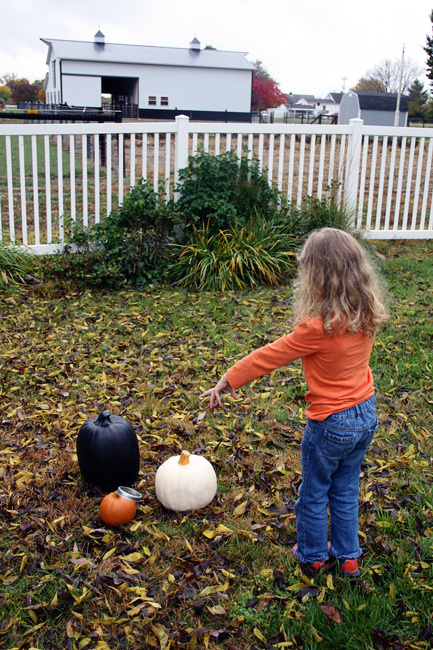 I decided upon a pumpkin ring toss game. 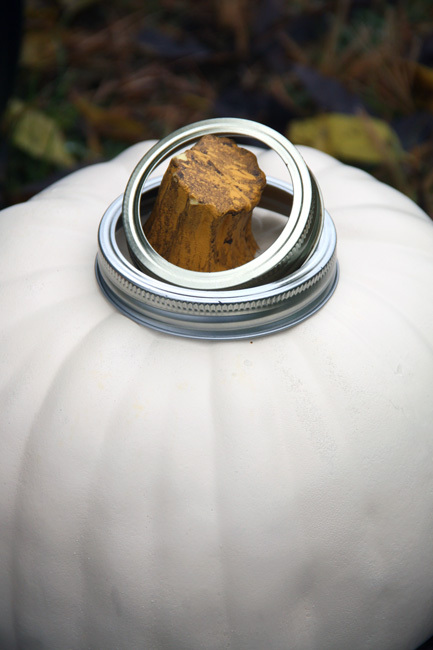 I bought the pumpkins at Target (not real, duh) and used a few mason jar rings I had around the house… that was all I needed. Ok, I did get some little prizes for the kids, but that was it. Now… Nathan is in 2nd grade, but I found this game to be a little hard. I think perhaps if I had bought REAL pumpkins with taller stems, it would have worked better. Darn me, I wanted to buy pumpkins I’d use again! It did seem to help to have the kids sit rather then stand when throwing the rings. 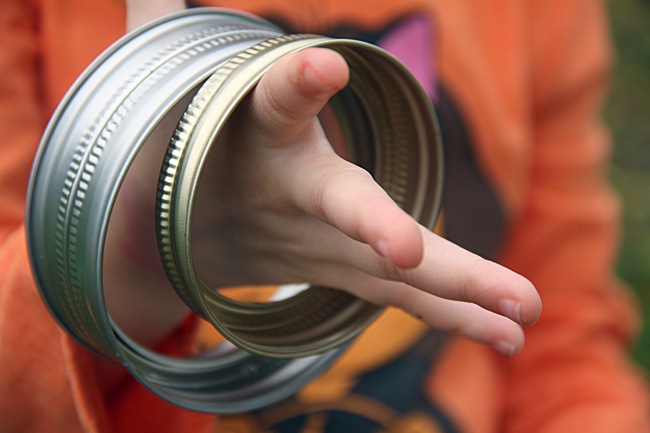 I loved the idea of using mason jar lids for this game. 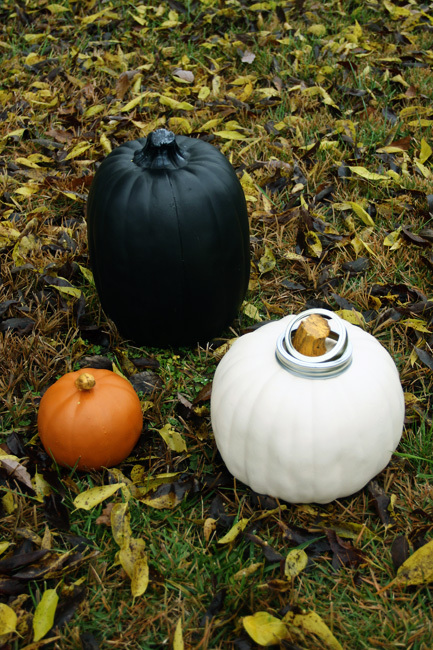 I already had a few mason jars in my basement and one of them had a smaller lid, so I told the kids if they got the smaller ring around any of the pumpkin stems, they’d get an extra turn! It was an easy game and I think his class really had fun with it. Plus, I had a little treat bag full of prices, which they loved, too! I think cheapy prizes always make games more fun! I gave every child a prize for participating, too. 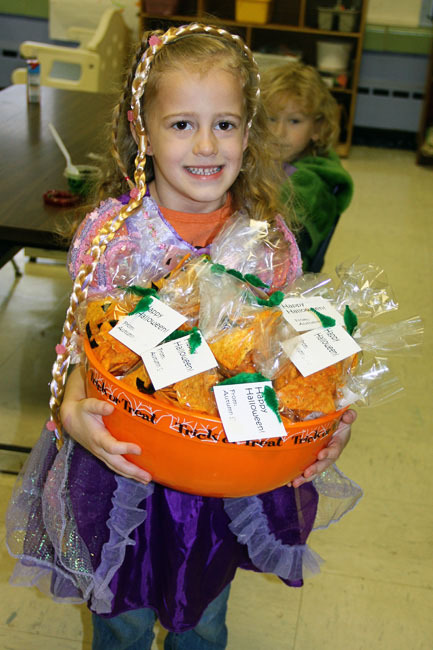 Autumn’s class treat. 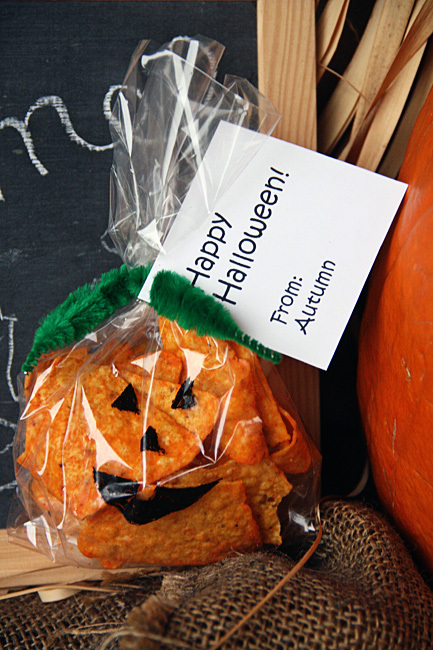 Dorito Jack O Lanterns. The girl loves Doritos and I thought a salty substitute to all the sweets would be nice. The girl could not wait to hand them out at school, she asked me several times during the party if it was time. 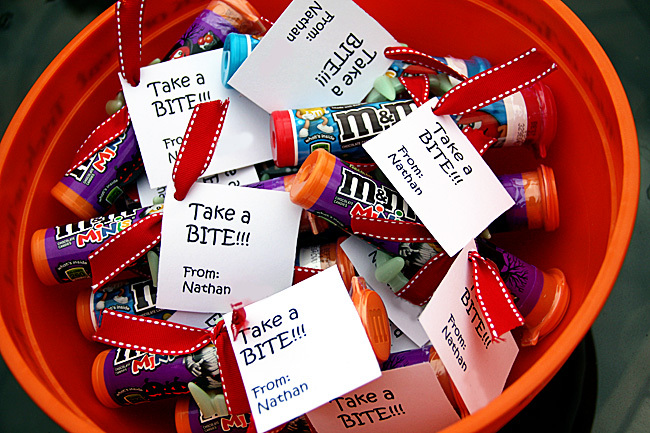 Nathan’s treat, glow in the dark vampire teeth and mini M&M’s. 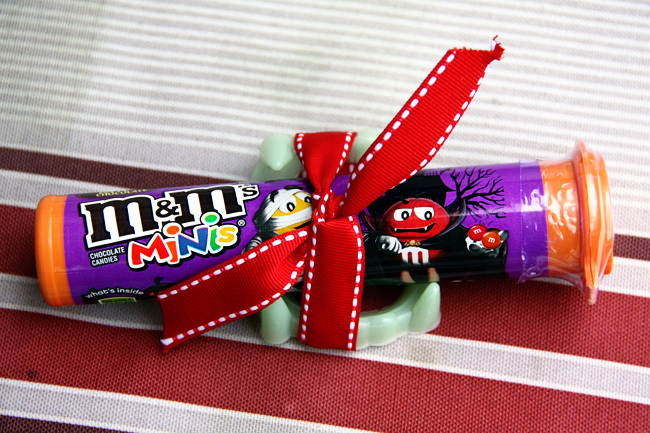 I was going to do a full size candy bar, but thought these mini M&M’s in the Halloween aisle were perfect. 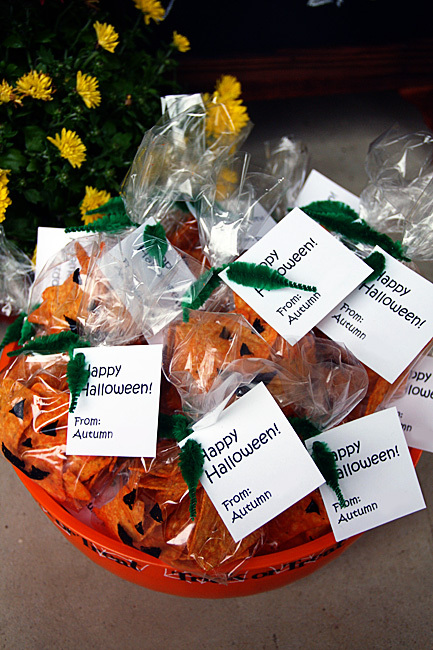 AND, I always fill their treat buckets with special goodies for them to enjoy in-between dinner and trick or treating. I always put 1 toy, flashlights, glow sticks, a book and candy in their buckets. Along with some other misc. Target $1 spot items. Well, that is it! Hope everyone had an awesome Halloween, too! This was one of my favorite Halloweens yet!